Motor shaft broken. Strain on motor or flaw in metal? Hi! In the middle of a pressrun (not starting it up or doing something sketchy) there was a loud clack and the pulley went flying off the motor. The motor shaft had broken off in the middle (see pics). 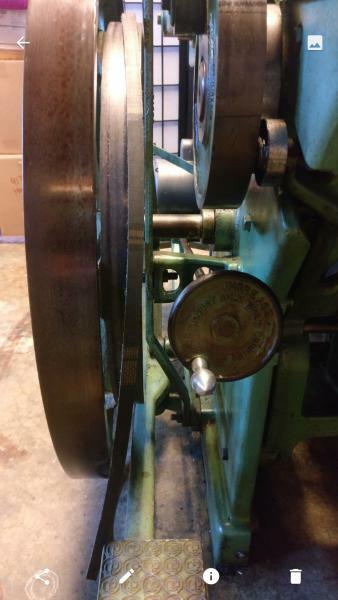 This press is a new style 8 x 10 Chandler and Price that has to have been made late in the game because it was built to actually have a motor and has a handle to tighten or loosen to change speed (not sure the year because the serial number doesn’t seem right, which I’ll post about as well in another thread since it would help to know for future problems). The motor on there is not a variable speed motor and we’re not using a VFD. It’s a 1/2 hp single phase baldor motor that runs at 1200 rpm off standard 110 power model # L3505. It was attached to a spring pulley Lovejoy brand. The system has been working for 2 years and I’ve been using it for maybe 5 months or so. I’ve been reading a bunch about all the ways of converting and having variable speed motors or VFDs but I’m curious if any of the more electronically inclined (I tend heavily towards mechanical over electrically-minded) have ideas of if this is a motor-situation mismatch or if the shaft itself would have been flawed. I’m sure I wasn’t running it at 1200 and there was definitely tension on the belt, but I’ve run it for much longer at the same speed so it’s surprising. What do you all think? I see there’s a spec number on the motor plate but I can’t read it. I would look that spec up on line. In your application, you are subjecting the shaft to a significant radial load (load at right angles to the shaft). That motor might have been designed only for loads in line with the shaft, such as if you were to couple it with a shaft coupling, directly to a centrifugal water pump, gear reduction box, etc., etc. There is some sort of spring deal on the outside of this pulley. I’m guessing this variable speed setup works off the outside pulley half moving on the shaft, which gives you a different size pulley. Large faster speed, smaller slower speed. This is how many snowmobiles and some car transmission (CVT) work….sort of like this. 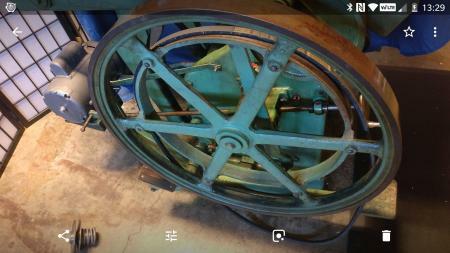 BUT….in those setups you have two pulleys that move. As one gets smaller and other one gets larger….works great. 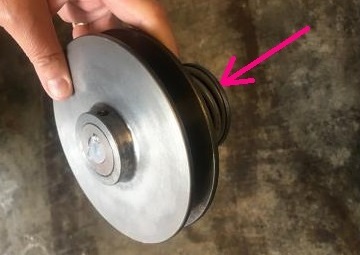 It’s key both move in opposite size directions….that way your belt (which is fixed size) doesn’t break In your setup your only changing one side….which is changing your pulley size at the motor and your press side it fixed along with your belt. When you change one pulley size then you need a larger or smaller belt. I’m guessing you were running at a higher speed and the belt was very very tight putting a huge stress on that shaft. It broke right were the key way is at. (the key is also round stock in a square key way hole - ODD!!!) Sure you’ve been running like this for a long time….but finally the stress of the metal flexing just the smallest amount caught up to you and broke, metal fatigue. That be my thoughts. you can get by with what you had. DO NOT try to slow the machine speed down however, without the press turning. you can turn it by hand, to slow the speed down, but standing static, and reducing speed puts incredible lateral stress on the shaft, as mentioned above.